On this date in 1661, Presbyterian lord Archibald Campbell, the first Marquess of Argyll, lost his head at Edinburgh. Once a privy councilor to King Charles I, “Red Argyll” had been in the 1640s a great champion of Scottish national liberty and a leader of the Presbyterians in the many-sided wars that tore apart the British Isles. Scotland’s Presbyterians — who favored bottom-up church governance as opposed to the crown-controlled selection of bishops that’s known as episcopacy — made an initial alliance with English Parliamentarians to support one another in their mutual hostilities with King Charles I. And in Scotland’s civil war in the mid-1640s, Argyll’s Presbyterians defeated the Earl of Montrose‘s royalists. But the failure of Oliver Cromwell‘s similarly victorious Parliament to deliver on its covenant fractured the Presbyterian party and drove Argyll to the political sideline. Argyll’s own opposition to other Presbyterians’ attempted engagement with the imprisoned Charles I became untenable when, to the horror of his countrymen, Charles was beheaded by Parliament. As his entry in the Dictionary of National Biography notes, Charles’s execution “completely upset his calculations, which had all along been founded on a close union between the parliaments of Scotland England … the results of his safe and prudent policy were ruthlessly annihilated … [and] Argyll lost his presence of mind, and therefore his control of events in this stupendous conjuncture, and became as much a puppet in the hands of contending factions as was Charles II.” His growing ranks of foes derisively nicknamed him the “Glaed-Eyed Marquis”, attributing an obvious metaphorical import to his imperfect eyesight. But as events ran away from him he fell into debt, disgrace, and irrelevancy. When Charles II resumed the throne in 1660, Argyll presented himself at the court of his would-be father-in-law, and was surprised to find himself immediately thrown in the Tower. Like the Presbyterian cause itself, he was permanently and tragically alienated from both factions of the English Civil War: Cromwell always suspected Argyll a royalist for that whole crowning-the-king thing, and Charles always resented Argyll for his part in the destruction of his father. The Glaed-Eyed Marquis found himself shipped off to Edinburgh to stand trial for treason. Although records of the trial are lost, it’s said that he was on the verge of total acquittal when Cromwell’s former commander in Scotland, George Monck, delivered a packet of incriminating letters. This story might be apocryphal but Argyll lost his head all the same, on Edinburgh’s distinctive Maiden. 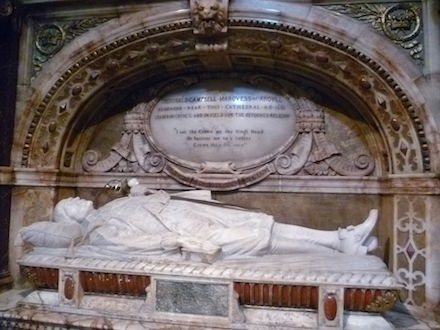 Memorial to Archibald Campbell in Edinburgh’s St Giles’ Cathedral with the epitaph “I set the Crown on the King’s Head. He hastens me to a better Crown than his own.” (cc) image from Kim Traynor. Argyll’s son and heir, also named Archibald Campbell, was himself executed in 1685 for organizing a Scottish “Argyll’s Rising” against King James II in alliance with the Duke of Monmouth. Their descendants still maintain the rank of Duke of Argyll to this day. On this day in 1650, James Graham, Earl of Montrose, was hanged in Edinburgh. 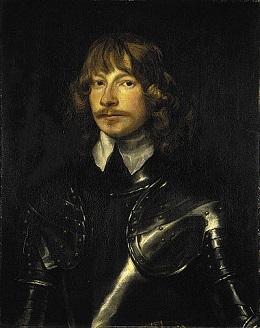 The tragic “Great Montrose” was renowned for his tactical genius on the battlefield during the civil wars that cost King Charles I both crown and head. 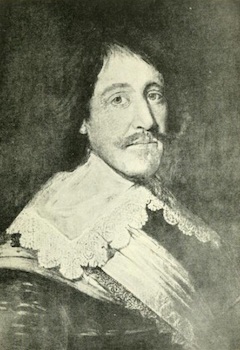 Although Montrose would die as a royalist he first entered the lists in the 1630s’ Bishops’ War as part of the Covenanter army resisting the king’s bid to impose top-down religious governance on Scotland. But Montrose was the moderate and post-Bishops War found himself a leading exponent of the pro-reconciliation faction, bitterly opposed by the chief of the Campbell clan, the Marquess of Argyll. These two became the opposing poles for the ensuing civil war in Scotland, at once a local clan war and the vortex of a border-hopping conflict that sucked in Ireland and England too. Although Montrose, now King Charles’s lieutenant-general in Scotland, could kick tail in battle his faction was divided and ultimately outnumbered by the Covenanters. Montrose had to flee Scotland for exile in 1646. The execution of Charles I opened the door for Montrose’s own untimely end, in one of those classic affairs of double-dealing. The exiled Charles II, having now inherited the claim, named Montrose his lieutenant in Scotland and dispatched his family’s longtime paladin back to native soil to try to raise an army. But even as he did so, he was negotiating with Argyll’s Covenanters, who saw a chance to make good their political and religious objectives by playing kingmaker with their former enemy. So when Montrose landed in 1650, he found little support and was overwhelmed at the Battle of Carbisdale. 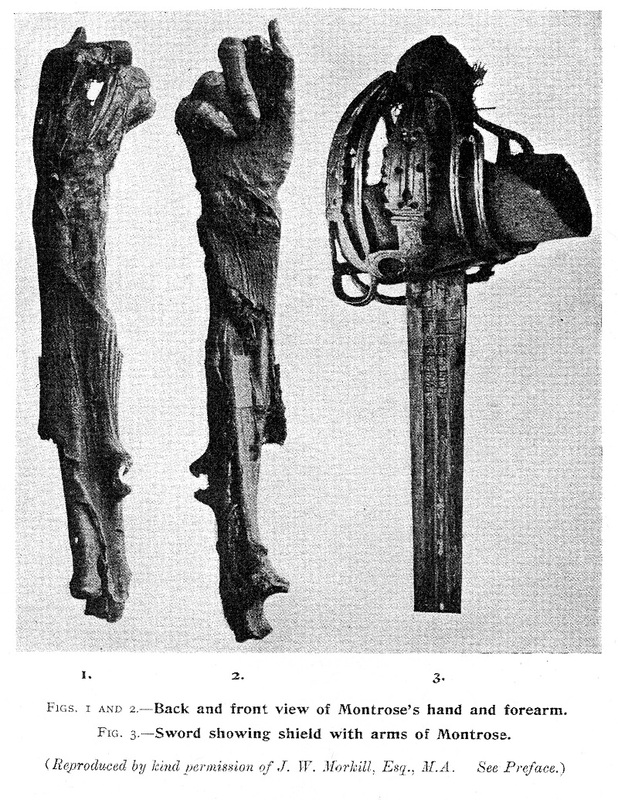 After several days’ wandering he sought refuge with a former friend who he did not realize was now also on the government’s side, and was promptly arrested and given over to his enemies for execution and for posthumous indignities: his head was mounted on a pike atop Edinburgh’s Tolbooth, and his four limbs nailed to the gates of Stirling, Glasgow, Perth and Aberdeen. After the end of Cromwell‘s Protectorate, and the actual restoration of Charles II, these scattered remains were gathered up and interred with reverence at St. Giles Cathedral. The present-day Dukes of Montrose are his direct descendants.